You've probably noticed artichokes at the front and center of your local grocery store or farmer's market recently, as spring is artichoke season; They may look like strange, complicated vegetables if you've never cooked them before. But have no fear! They are very easy to prepare. The process of rinsing, trimming, and seasoning an artichoke takes no more than 10 minutes total. There are multiple ways to prepare and cook artichokes: I've boiled, sautéed, and steamed them in the past, and these are all tasty preparations in their own way. However, none of these methods hold a candle to my favorite way to cook these babies—roasting. 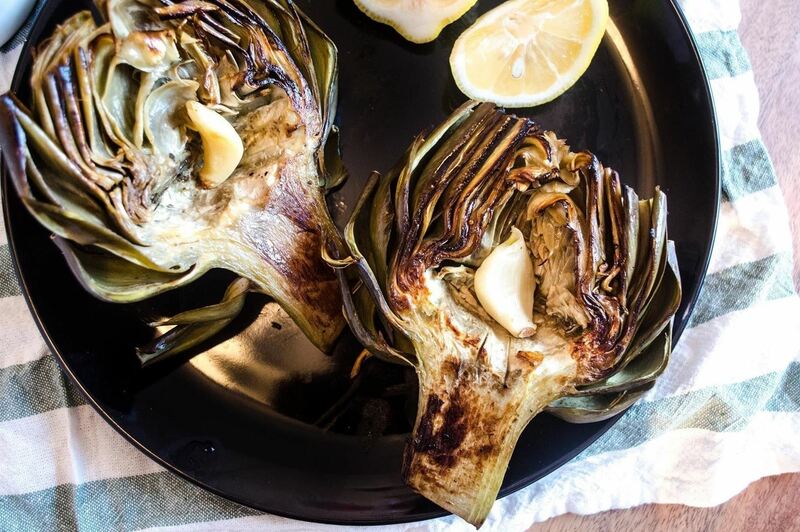 Roasting is the best way to really experience eating an artichoke; The caramelization of the sugars in the artichoke itself create a woody yet sweet flavor that leave an immediate impression. Additionally, the crispy texture of the individual leaves provides an excellent contrast to the soft, creamy heart of the artichoke itself. In other words, it's absolute heaven. 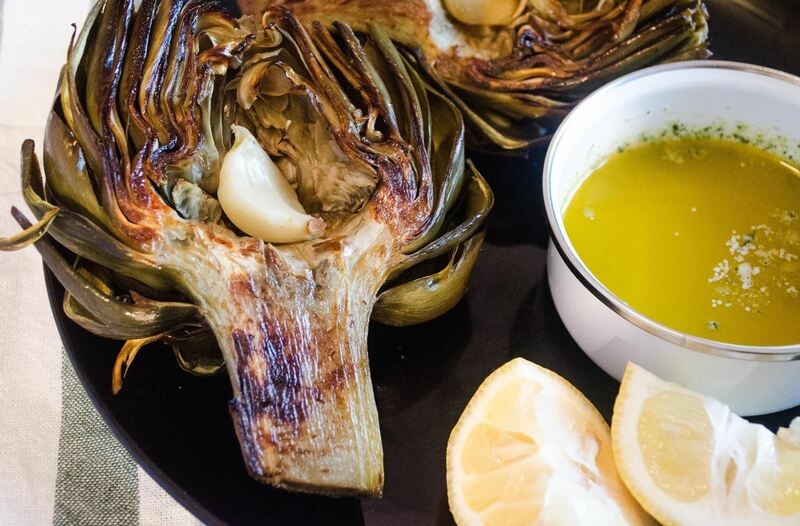 My favorite way to roast an artichoke is using garlic, lemon juice, compound butter, and salt. These are four simple ingredients you probably already have at home. Together, they form a bright, rich, and complex flavor profile. 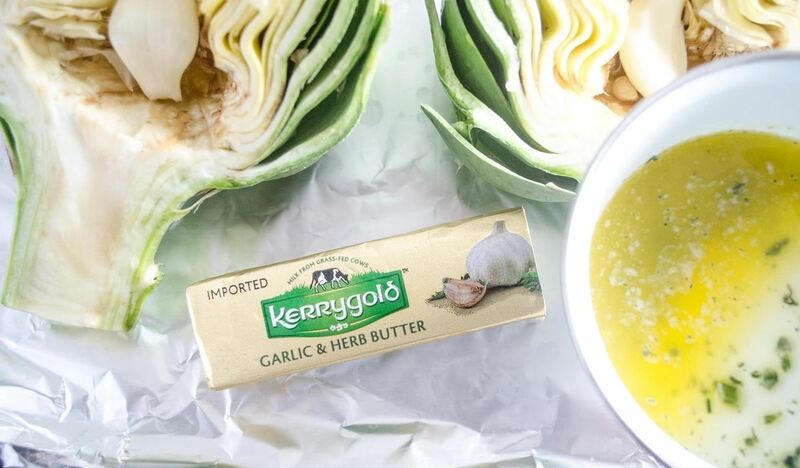 Now that we've covered the 'why' of artichoke roasting, let's talk about the 'how'—from prepping to the finished product. 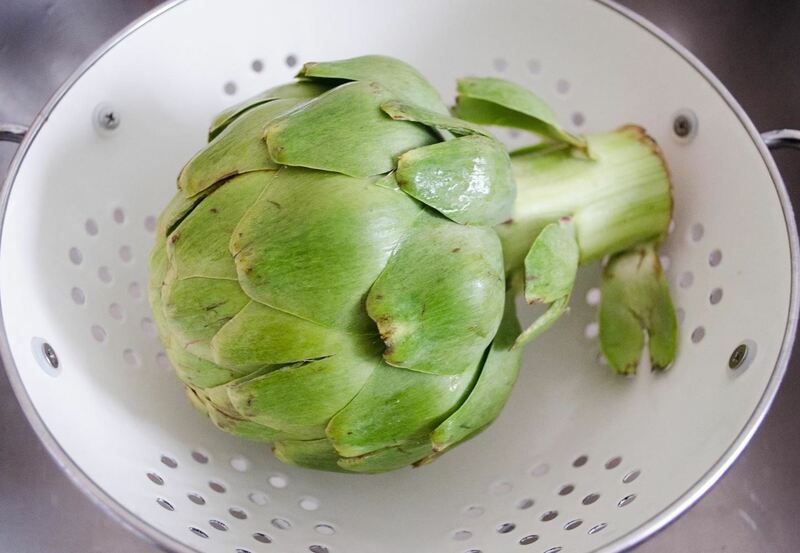 Rinse your artichoke well, which will remove dirt or dust from the leaves. Then, dry the artichoke with a paper towel. The stem of an artichoke is hard and inedible, so trim about ½ inch off the artichoke's bottom stem. Just make sure not to trim too high or you will risk losing some of the heart. 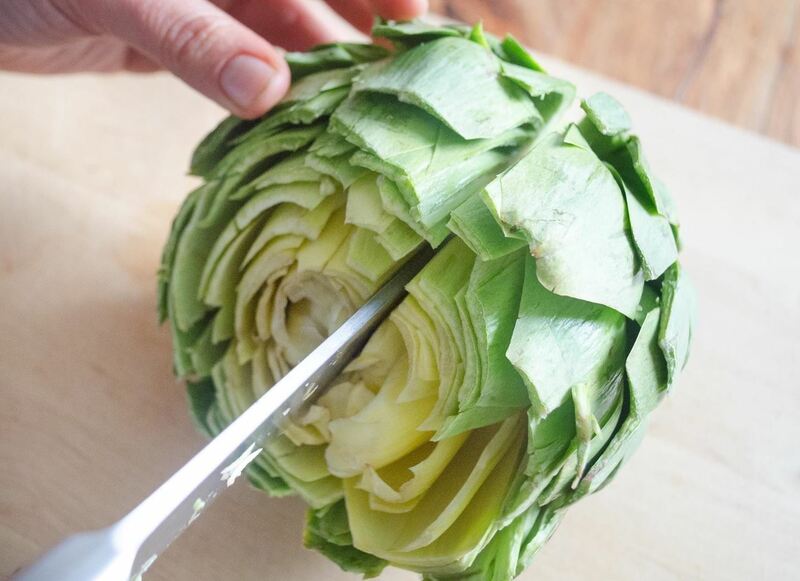 Trim ¼ inch off the artichoke's top to remove the sharp edges to the leaves. It will also give the vegetable a clean look. 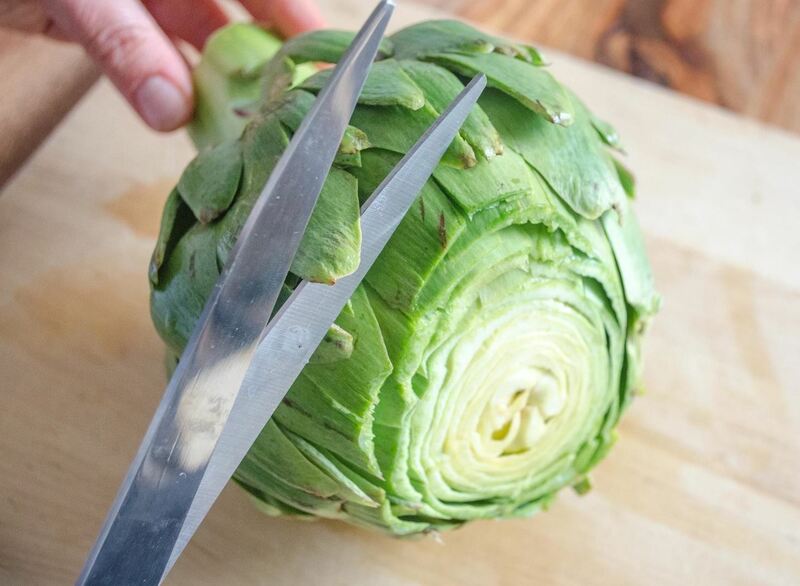 This is an optional step: use kitchen shears to cut the tips of the leaves off of the artichoke. After the artichoke is cooked, the leaves will soften, so they'll be looser and much easier to peel from the center. 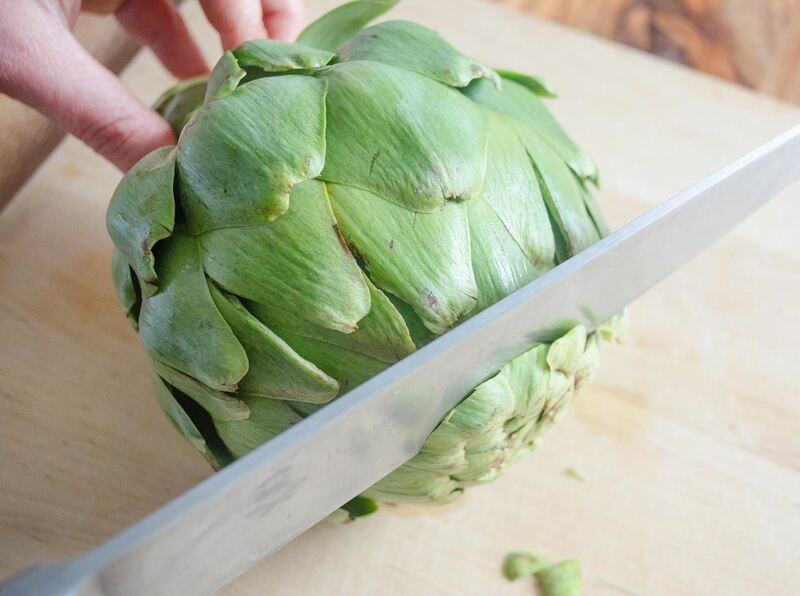 However, trimming the leaves will give your artichoke a restaurant-style appearance and makes peeling even easier. 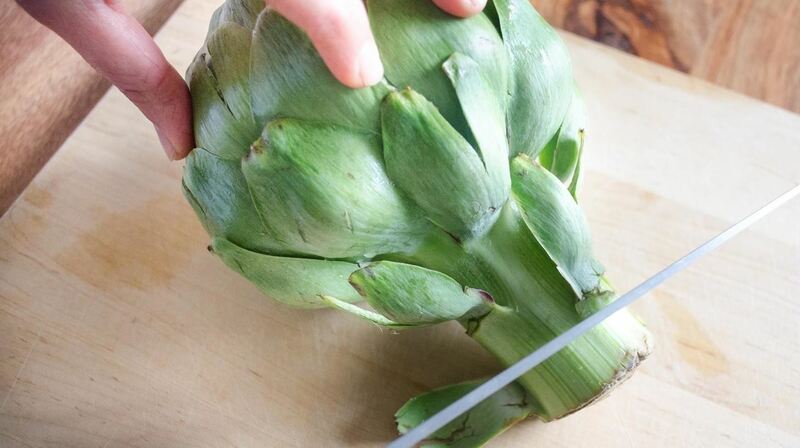 Use your hands and pull around the artichoke to loosen the leaves from the center. 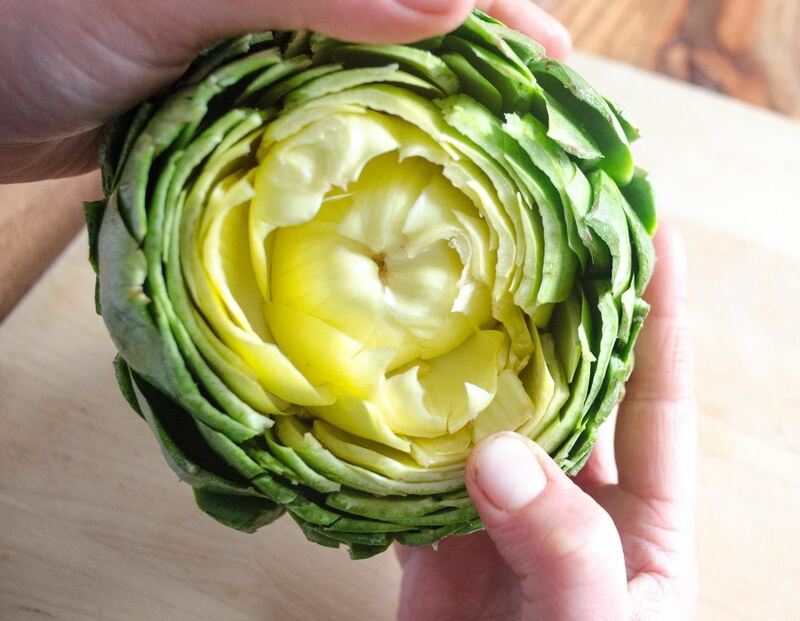 Opening the artichoke up will allow the butter, lemon juice, and spices to penetrate the leaves. 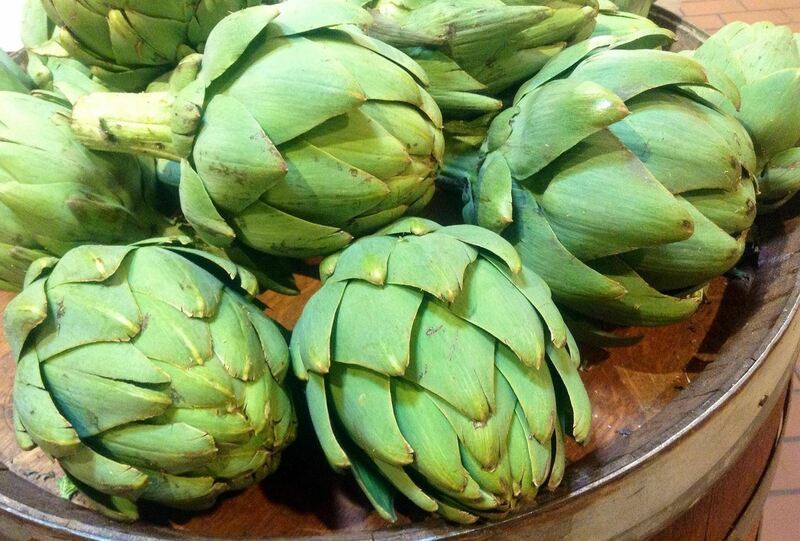 The more you open the artichoke, the more flavor it will have. Cut the artichoke in half down the center. 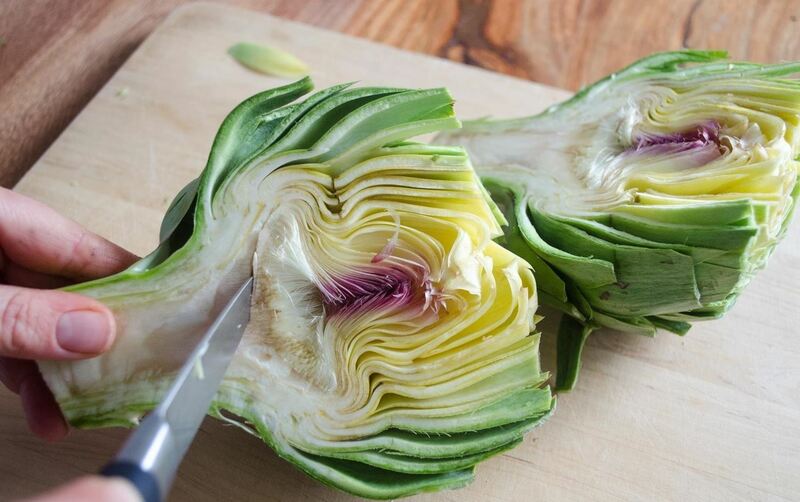 Use a small, sharp knife to cut the prickly center out of the artichoke—this includes the purple leaves. The center of an artichoke is too sharp to eat, so make sure you remove these sharp leaves completely. 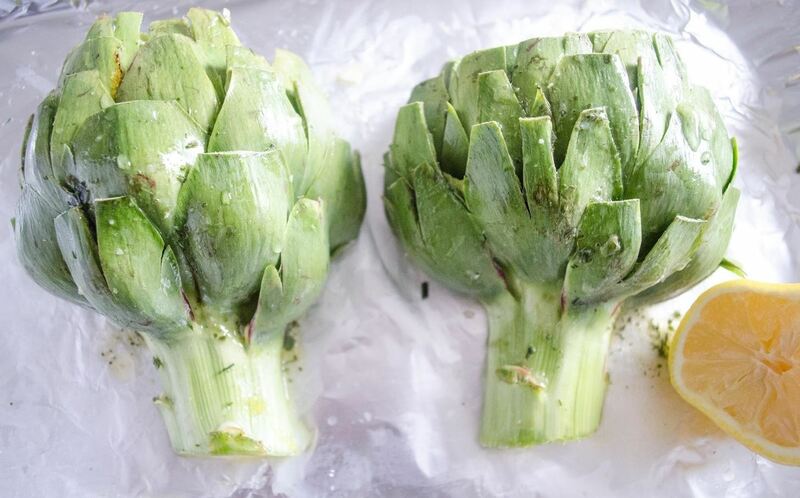 Set the artichokes face up on a sheet pan lined with foil. Then, place a large clove of garlic in the center of each half. The garlic should fit perfectly into the spot where the prickly leaves used to be. 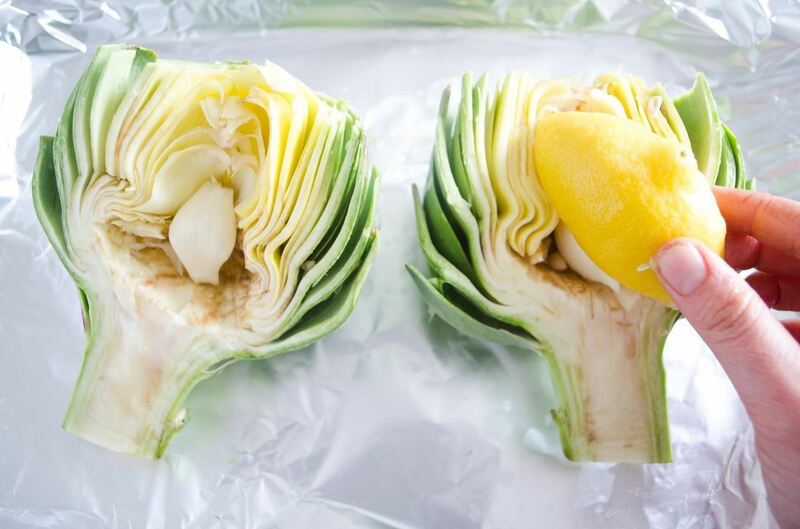 Squeeze half a lemon onto the artichokes, then rub the lemon on the surface of the artichoke. 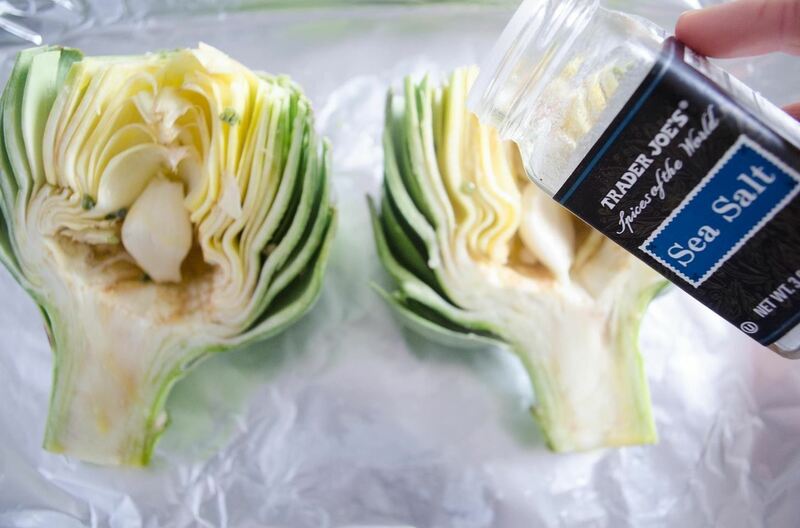 Sprinkle the artichoke with sea salt to taste. Turn the artichokes over, then follow the same few steps with the outer halves (lemon rub, butter, and sea salt). 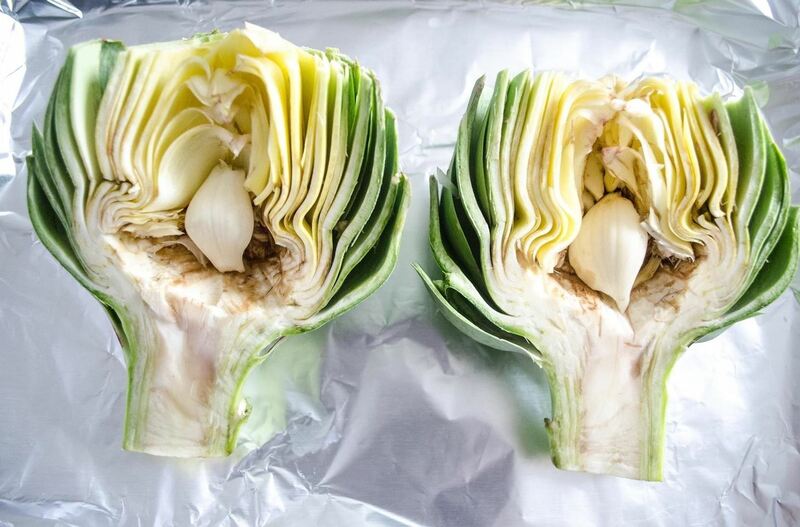 Leave the artichoke halves face down and cover them in the foil. 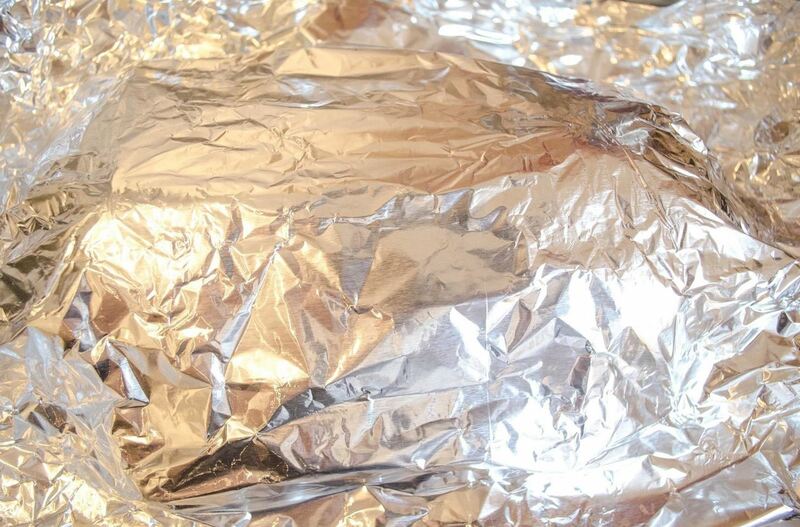 Wrapping the artichoke in aluminum foil will prevent it from burning on the outside over the prolonged roasting time. Roast the artichokes in the oven at 425°F for 35-40 minutes. When time is up, flip the artichokes back over to reveal their deep golden color. If you do choose to go the recipe route, artichokes are a star ingredient in dips, pasta dishes, and soups, among many other things. While not as simple as other spring veggies, such as peas or asparagus, artichokes are absolutely worth the effort. And roasting them only makes the payoff even greater—the crisp leaves, golden flesh, and complex flavors just beg to be eaten. The results, as you can see above, clearly speak for themselves. Do you have a favorite way to season artichokes? Share your culinary insights with us in the comments below. I will definitely try this recipe, so thanks for that. Hi, with this recipe, can you eat the entire leaves, or do they stay chewy?